The MCV Campus Recreation and Aquatic Center is designated as LEED Silver building. 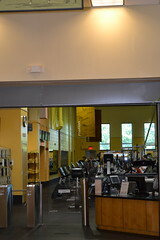 MCV Campus Recreation and Aquatic Center, now part of the Jonah L. Larrick Student Center, houses a fitness center with a wide variety of cardio, strength training equipment, free weights, heavy bag and speed bag. The Aquatic Center features a 25-meter lap pool with lift, and heated spa.